I like Akismet, and it’s undeniably effective in stopping the vast majority of spam, but it adds a huge number of comments to the database and a very small percentage of comments still get through to my moderation queue. It’s annoying to find comments in my moderation queue, but what I really object to is the thousands of records that are added to the database each month that I don’t see. 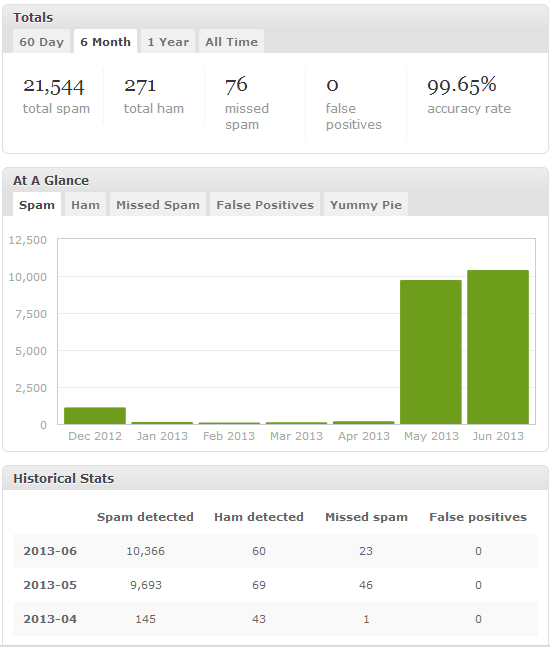 In the screenshot below, January through April show very few spam comments being detected by Akismet. This is because I was using my cache-friendly method for reducing WordPress comment spam to block spam comments even before Akismet analyzed them. In May, I moved hosting providers to asmallorange.com and started with a fresh install of WordPress without implementing my custom spam method, which admittedly was not ideal because it involved changing core files. This left only Akismet between the spammers and my WordPress database. Since that time, instead of 150 or fewer spam comments per month making it into my WordPress database, Akismet was on pace to let in over 10,000. A collection of web development tools for building better sites more easily. placehold.it is a quick and simple image placeholder service. TextFixer is a collection of online text tools. Remove line breaks from text, alphabetize text, capitalize the first letter of sentences, remove whitespaces, and uppercase text or lowercase text. HTML Minifier will minify HTML (or XHTML), and any CSS or JS included in your markup. CSS3 Generator is an awesome code generator for CSS3 snippets, and shows the minimum browser versions required to display the effects. proCSSor is an advanced CSS prettifier with tons of formatting options. Fontshop.com has written A Field Guide to Typography to get you excited about fonts and typography. Typetester is an online app for comparing different fonts for the screen, you can test up to three fonts at a time and choose the one you like. Its primary role is to make web designer’s life easier. A quick chart of the fonts common to all versions of Windows and the Mac equivalents, or a more extensive matrix of fonts bundled with Mac and Windows operating systems, Microsoft Office and Adobe Creative Suite. More resources at: 50 Useful Design Tools For Beautiful Web Typography and 21 Typography and Font Web Apps You Can’t Live Without. Google Webmaster Tools’ Rich Snippets Testing Tool. Use the Rich Snippets Testing Tool to check that Google can correctly parse your structured data markup and display it in search results. I’ve written a number of posts on ways to reduce the number of spam comments a blog receives. In this post, I’ll revisit an old method that has almost completely stopped spam comments at ardamis.com before they get to the database. Both methods were very effective at blocking spam before it made it to the database. In the five months leading up to the implementation of the first method, Akismet was catching an average of 1418 spam comments per month. In the first five months after these methods were put in place, Akismet was catching only 54 spam comments per month. But I also noticed a reduction in legitimate comments, from an average of 26 per month to 20 per month, which led me to suspect that real visitors attempting to leave comments were being discouraged from doing so. The timestamp method required changing a core file, which was overwritten each time WordPress was updated. As time went on, I forgot to replace the file after upgrading WordPress, so the protection was lost and I once again had only Akismet blocking spam. A few months later, while doing work on the database in an attempt to speed up WordPress, I happened to check my historical stats and found that Akismet had detected 4,144 comments in July, 2010. Yikes. It was time to revisit these old methods. At 2:30 AM on August 1, 2010, I again implemented my timestamp method, but this time I also renamed the wp-comments-post.php file that processes the form. I changed my theme’s comments.php file to submit the form to the new page, deleted the wp-comments-post.php file from the server and tested to make sure that comments could still be submitted. And then I waited to see what would happen. The effect was pretty amazing. The spam had almost completely stopped. The quick and easy way to reduce the number of spam comments that your WordPress blog receives is to merely change the location of the comment form processing script. Rename wp-comments-post.php to anything else. I like using a string of random hexadecimal characters, like: z1t0zVGuaCZEi.php. Edit your current theme’s comments.php so that the form is submitted to this new file. Upload these files to their respective directories, then delete the wp-comments-post.php file from your server. To illustrate the effectiveness of the renamed wp-comments-post file + timestamp check, below are some events from my 06 August 2010 access log. Here is a form submission to the non-existent wp-comments-post file that occurs 2 seconds after the post page is requested. 173.242.112.44 - - [06/Aug/2010:23:21:37 -0700] "GET www.ardamis.com/2007/07/12/defeating-contact-form-spam/ HTTP/1.0" 200 32530 "http://www.google.com" "Mozilla/4.0 (compatible; MSIE 6.0; Windows NT 5.1; en) Opera 8.50"
173.242.112.44 - - [06/Aug/2010:23:21:39 -0700] "POST www.ardamis.com/wp-comments-post.php HTTP/1.0" 404 15529 "//ardamis.com/2007/07/12/defeating-contact-form-spam/" "Mozilla/4.0 (compatible; MSIE 6.0; Windows NT 5.1; en) Opera 8.50"
The bot is sent a 404 HTTP status code, which is widely understood to mean that the page isn’t there and you can stop asking for it. But that doesn’t stop this bot! Two minutes later, it’s back at another page, trying again. 173.242.112.44 - - [06/Aug/2010:23:23:01 -0700] "GET www.ardamis.com/2007/03/29/xbox-360-gamercard-wordpress-plugin/ HTTP/1.0" 200 101259 "http://www.google.com" "Opera/9.64(Windows NT 5.1; U; en) Presto/2.1.1"
173.242.112.44 - - [06/Aug/2010:23:23:05 -0700] "POST www.ardamis.com/wp-comments-post.php HTTP/1.0" 404 15529 "//ardamis.com/2007/03/29/xbox-360-gamercard-wordpress-plugin/" "Opera/9.64(Windows NT 5.1; U; en) Presto/2.1.1"
Again, it gets a 404 back. Some bots never learn. Here is a form submission to the renamed wp-comments-post file that occurs 4 seconds after the post page is requested. 91.201.66.6 - - [06/Aug/2010:23:30:41 -0700] "GET www.ardamis.com/2007/03/29/xbox-360-gamercard-wordpress-plugin/ HTTP/1.1" 200 21787 "-" "Mozilla/4.0 (compatible; MSIE 7.0; Windows NT 6.1; WOW64; Trident/4.0; SLCC2; .NET CLR 2.0.50727; .NET CLR 3.5.30729; .NET CLR 3.0.30729)"
91.201.66.6 - - [06/Aug/2010:23:30:45 -0700] "POST www.ardamis.com/wp-comments-post-timestamp-3.0.1.php HTTP/1.1" 500 1227 "//ardamis.com/2007/03/29/xbox-360-gamercard-wordpress-plugin/" "Mozilla/4.0 (compatible; MSIE 7.0; Windows NT 6.1; WOW64; Trident/4.0; SLCC2; .NET CLR 2.0.50727; .NET CLR 3.5.30729; .NET CLR 3.0.30729)"
The 500 HTTP header indicates that this submission was denied and the comment never made it to the database. This access log doesn’t indicate which check stopped the POST (eg: the email validation or the timestamp function), but my money is on the timestamp. Here’s another form submission to the renamed wp-comments-post file that occurs one second after the post page is requested. Speed reader or bot? 95.220.185.210 - - [06/Aug/2010:23:56:54 -0700] "GET www.ardamis.com/2010/02/26/fixing-word-2007-add-in-issues/ HTTP/1.1" 200 23977 "-" "Opera/9.01 (Windows NT 5.0; U; en)"
95.220.185.210 - - [06/Aug/2010:23:56:55 -0700] "POST www.ardamis.com/wp-comments-post-timestamp-3.0.1.php HTTP/1.1" 500 1213 "//ardamis.com/2010/02/26/fixing-word-2007-add-in-issues/" "Opera/9.01 (Windows NT 5.0; U; en)"
To take this method even further, one could send a 200 OK header even when the comment is blocked, so the bots never know their mission failed. But this seems unnecessary at this point, as it doesn’t appear that they change their behavior after being sent a 404 error, or that they try again after being sent a 500 error. It also makes it harder to figure out from the access logs which comments were rejected and for what reason. If you still want to do this, first implement the timestamp method, then make the following modifications. One could also write a record to a database each time the old wp-comments-post.php file is requested or any of the timestamp checks block a form submission, and pretty quickly generate a list of IP addresses for a black list. At the same time, one could log which timestamp check caught the spam attempt, which is interesting enough that I’ll probably do it eventually. This entry was posted in Web Site Dev, WordPress and tagged blogging, comment spam, spam, themes, WordPress on 9 August 2010 by Oliver Baty. I’ve been collecting links to good WordPress templates for a long time. Because I’ve been asked a few times recently if I can recommend some templates, I’m putting them together here. I really like these themes for focusing almost exclusively on one’s portfolio. They feature a massive, animated slideshow that keeps the visitor’s attention on the images. In some cases, a shadow underneath the slideshow, combined with the animation, creates a 3-D effect to put the portfolio right in the visitor’s face. These themes are a bit more modest than the first collection. They still accentuate a portfolio of images, but in a less flashy way. The slideshow exists within a defined banner area, so the look is a little more traditional. These templates would be a better fit for businesses. These themes use only part of the banner to display a rotating group of images, leaving an area for text next to the images. This allows a short message or tagline to get equal placement. These are the most conservative themes. This last group of themes break with the conventions of the above themes and use full-screen-width or otherwise larger-than-normal images that rotate behind the other elements of the site. Undeniably attention-grabbing, but also slower to load. These are single-page web sites. These types of pages are great as business cards or resumes, or as place holders while a larger site is developed. I like these, too, but they don’t fit in any of the above categories. This entry was posted in Web Site Dev, WordPress and tagged blogging, templates, themes, WordPress on 21 February 2010 by Oliver Baty. A friend who does a lot of selling on eBay asked me to develop a web application for generating HTML templates that could be copied and pasted into his auctions. He wanted to be able to add a title, a description, and some terms and conditions, and also to be able to upload images so the auction template would display thumbnails that could be clicked to display full-sized versions in a new window or tab. The more we talked, the more it sounded like something that would be both useful for a good number of people, and potentially a source of ad revenue for us. And so was born Simple Auction Wizard, an online HTML template generator for auction websites like eBay. The most difficult part was actually getting the templates to look good in a variety of browsers. Because the template HTML appears inside of a larger page, I couldn’t rely on Doctype switching to place IE into standards mode. This meant the templates would have to be developed so that they would look approximately the same in standards-compliant browsers like Firefox, Chrome, and Safari, as well as horrible browsers like IE6 in quirks-mode. I tried very hard to minimize the use of tables, but they eventually crept in. I was able to use CSS, for the most part, though if any more issues come up, I’m going to throw in the towel and just do inline styles. The web app is open to the public, but realize that it’s very early in its development and I intend to continue making changes.